Happy Friday my friends! We are coming close to Christmas and the New Year! I hope you have some wonderful plans for the holidays with your friends and families. Thanks for visiting our link party this week! I'm sure you will find some tasty recipes, cute crafts, and helpful hints at the party. 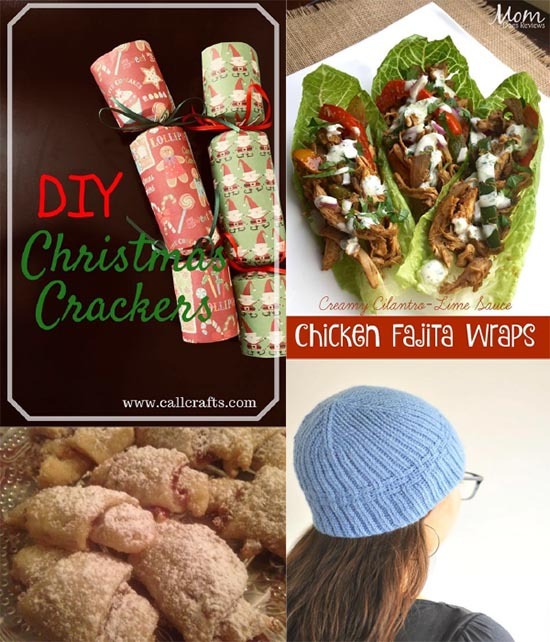 Add some extra fun to your holiday with DIY Christmas Crackers by CallCrafts. These Chicken Fajita Wraps with Creamy Cilantro-Lime Sauce by Mom Does Reviews look amazing! I love the idea of using lettuce leaves instead of tortillas. Try these buttery fruit filled Raspberry Rugelach by Seasonal and Holiday Recipe Exchange. Keep your head warm this winter with the beautiful City Break Hat from Kiku Corner.